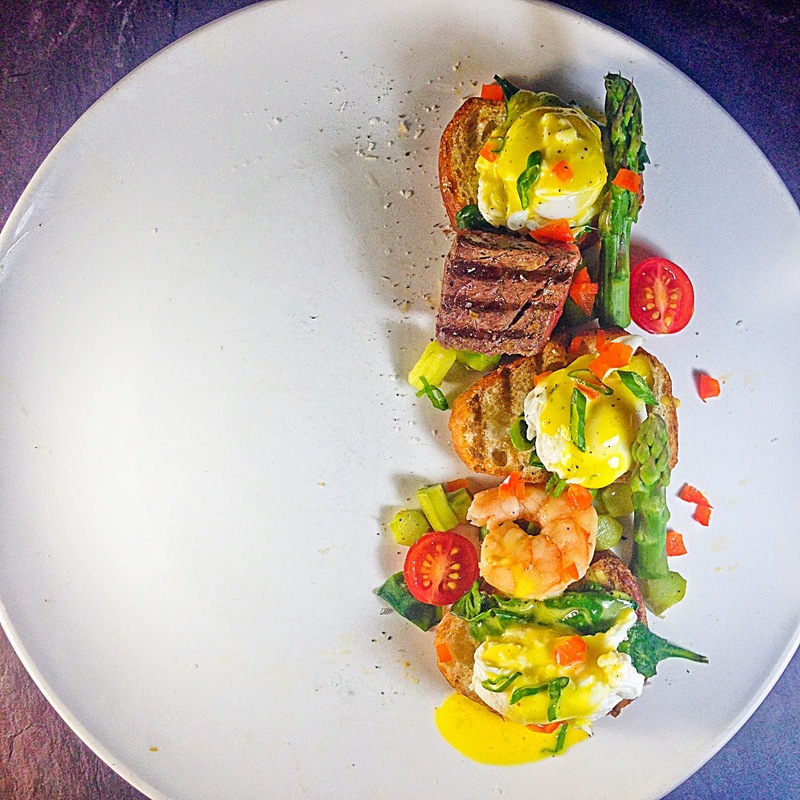 This months challenge for The Creative Cooking Crew is BREAKFAST - now if you have been following this blog even a little bit you will know just how fond I am of breakfast and brunch and brinner (which is Breakfast for Dinner). I love to make poached eggs. 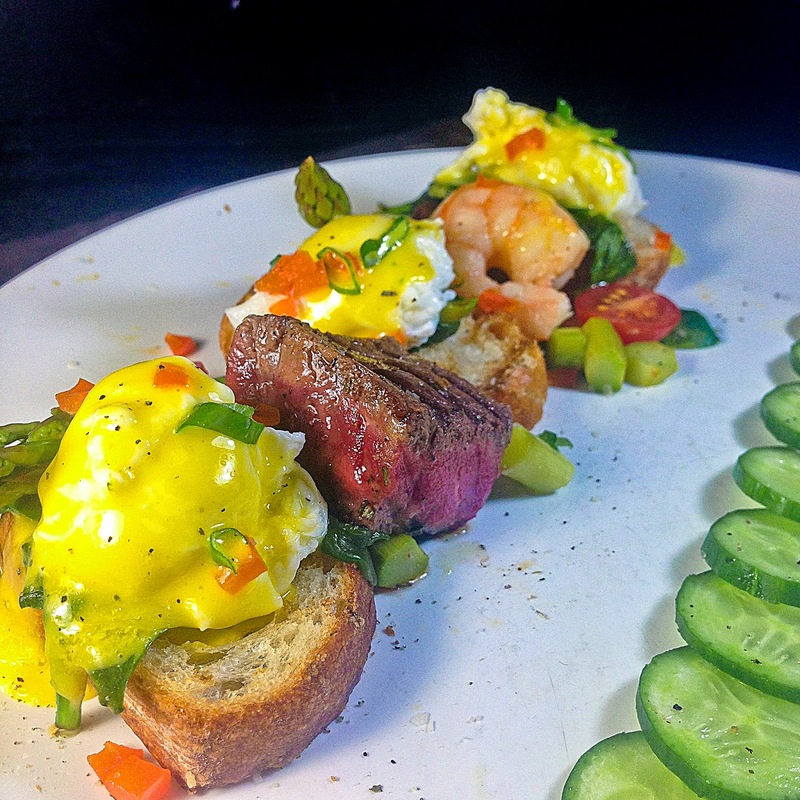 Eggs benedict with quail eggs, steak, shrimp, wilted spinach asparagus and a salad of grape tomatoes and cucumbers. This is a breakfast sure to delight even the most seasoned of "brunchers" with its wonderfully seasonal variety. I froze the steak so that I could cut it into perfect little squares and then I grilled it while it was still a little frozen so I could get it nicely rare while still giving it deep grill marks. If you have never poached a quail egg before let me just tell you that it happens in less than a minute so be prepared. This breakfast was a hit and I would serve this to anyone at anytime. 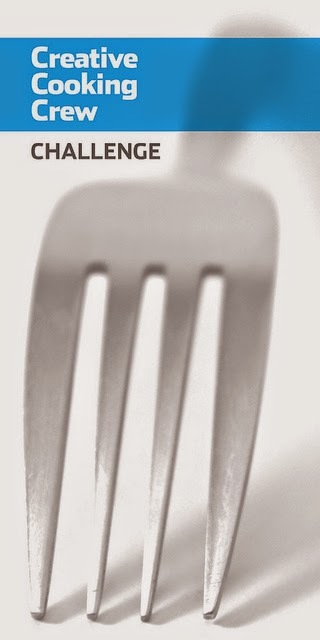 Thanks again Creative Cooking Crew for another great challenge. Lets throw one more into the mix - this was so good I had to make it again. The Egg man! 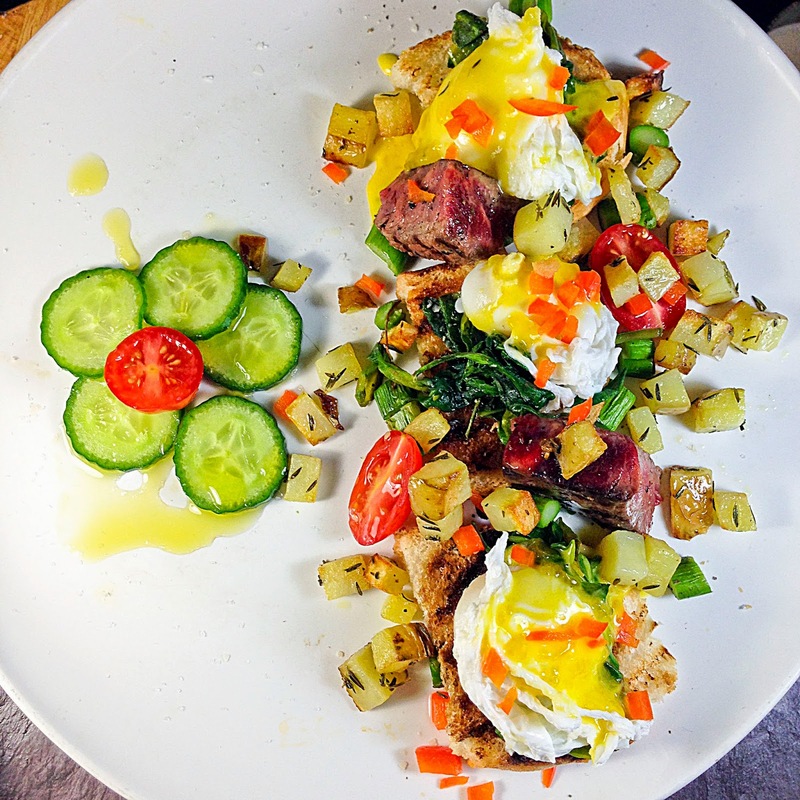 I love the combo of all flavors, the addition of steak and of course poached eggs, my fave. I've never tried to poach a quail egg, sounds like a very delicate act! Well done, Christo! Gorgeous and creative! Love the addition of shrimp … love the presentation! You rock! Love this brinner concept, especially with a poached egg to finish it off. Just beautiful and I like that tip about freezing the steak before cutting. Hi Christo - I adore this dish! The colors, everything. And your plating skills are over the top! 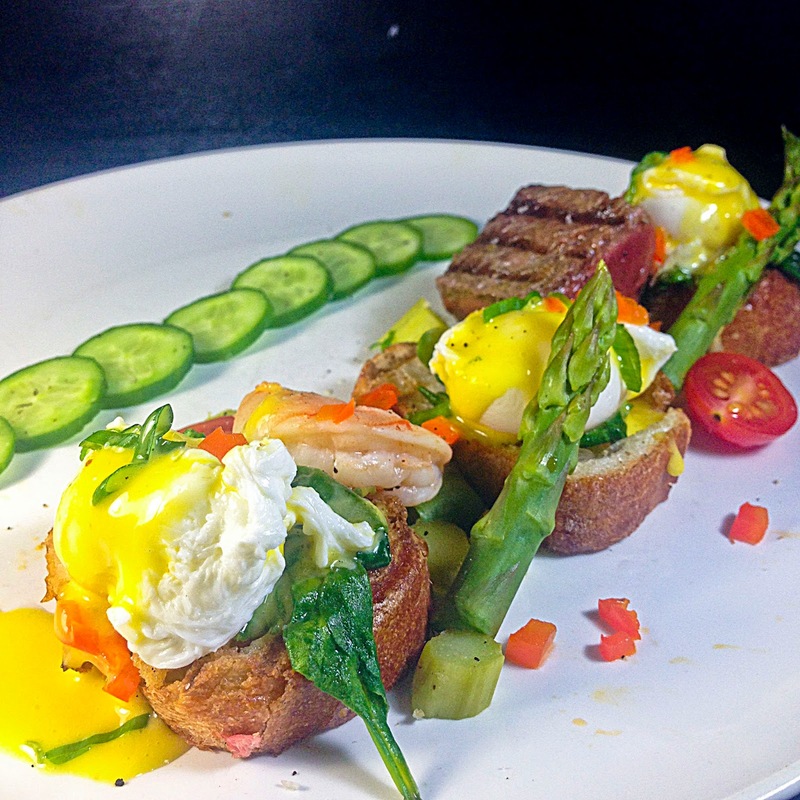 Your plating skills are over the top and a must try dish. I always look forward to your recipes. very pretty. The technique of cooking a frozen steak is one we use at home - if you ever get a chance, give a try to searing a frozen-solid ribeye, hard on both sides, and then into a 200F oven. 60 minutes for 1" steak. Sear again when it comes out; no need to rest. Great results.